If there were ever a time to look at creepy, crawly things up close, it's during Halloween, isn't it? 'Betcha can't guess what is in this picture. Go ahead, guess. Give up? It's a mosquito's heart 100 times magnified. This photomicrograph (photograph taken through a microscope) by Jonas King from Vanderbilt University won first place in Nikon's 2010 International Small World contest. Both this photo and the one at the top of a flea 20 times magnified, were taken using fluorescence microscopy. In fluorescence microscopy, the object being studied is stained with a special fluorescent material. It is then illuminated with a certain wavelength of ultraviolet light which it absorbs. The object then emits light at a different wavelength which is recorded by the fluorescence microscope. The picture above is of a five-day old zebrafish head (20 times magnified), taken using confocal microscopy. Confocal microscopy uses a single point of light to scan a subject into a series of optical sections, eliminating out-of-focus glare that appears with fluorescence microscopy. The result is a higher resolution, making it more useful when photographing 3D subjects. It can also be used to image living things. 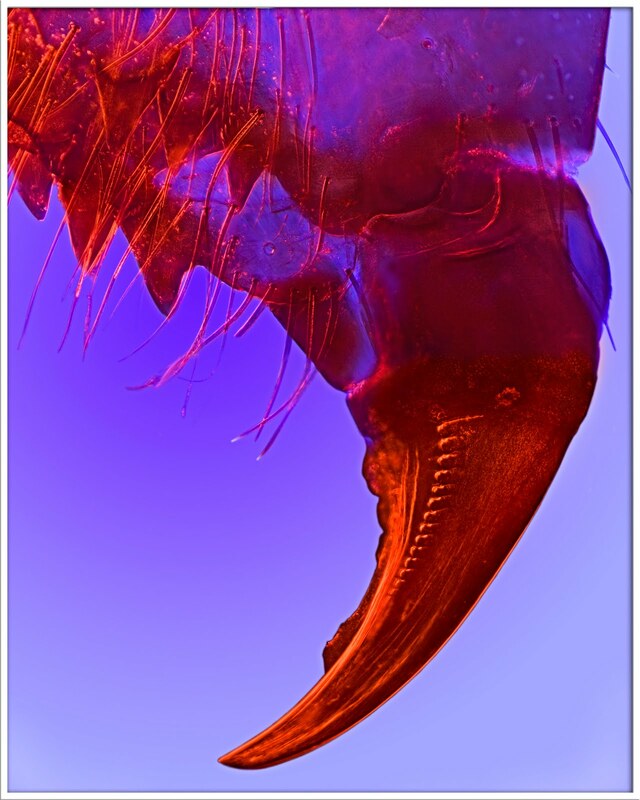 This image of a spider's mandible, or mouth, was taken using the Rheinberg illumination technique in which the lighting is carefully controlled and a special filter is used to make the background one color and the subject another color. The technique is good for making a photograph with a high contrast. To see more of this year's photomicrograph winners (including a really close-up look at crystallized soy sauce) and to learn more about microscopy imaging go to Nikon's Small World website. Also, to get a better appreciation of how much magnification is going on, check out Nikon's "universcale" where you can compare the diameter of a red blood cell (7 to 8 micrometers) to the diameter of the Milky Way (100 thousand light years) among other things.